For years now, I've rocked a Pebble watch on my wrist. Most of the time was with the original generation Pebble watch. It's all plastic, it's boxy, but it works. Later, I picked up a Pebble Steel from a buddy after he bought himself an Apple Watch. But coincidently, while I had closed the deal to buy my new Android Wear device, Pebble finally released version 3.8.2 of their watch OS for the original generation Pebbles, and wow, did that ever rejuvenate the watch. Pebble Timeline, new animations, new navigation... All new! So, I figured it was time to write a vs. article of the original generation Pebbles (with the latest OS) vs. the first gen. Moto 360. As said earlier, both of my Pebble watches received an update to version 3.8.2. This was a giant leap in the right direction, and it provided these "old" smartwatches a fresh new look and feel. Nothing looks or acts the same - and that is a good thing! Pebble Timeline has been included as seen on the Pebble Time series, so seeing what's coming ahead (or what you left behind) is now ridiculously easy. Speaking of the screen, for the sake of comparison to the Moto 360, the screen is always on. Period. I know the 360 could as well with the ambient setting, but unlike the 360, the Pebble's battery isn't taking a hit until the screen has a watchface that is constantly moving/updating. Notifications, my biggest reason for the smartwatch, are very clean and functional. It used to show up as all text, but now with 3.8.2, you are shown the app's icon at the top, with the content cleanly placed below. You can reply with presets of your own making (from the app on your phone) or an emoji. You can also dismiss the app on your phone from your watch, and even open the app on your phone. There is no mic on the original generation Pebbles, so 360 would have one this round with verbal responses to messages. Battery life has been a dream all this time. The Pebbles both go for 4-5 days on a single charge. I've never worried about using my watch too much and killing the battery before the end of the day. Durability is great. I know I've accidentally banged my watch against tables, door frames, etc. Not a lick of damage. The waterproof factor is awesome too. I've taken my Pebble for a swim, or do the dishes, and I was able to control my music without any issues. I've only had my Moto 360 for about a week, but I feel I have enough to go on already to make the comparison. On my wrist, and this is personal taste, I find that the Moto 360 looks way better than the Pebble Steel, and certainly better than the Pebble. Yes, it is a large device and I've had many friends and family already say, "Wow, that's big." The size is quickly forgotten though as I haven't noticed it get in my way at all. Besides, the larger size makes it easier to see what is happening on my wrist. That leads me to the screen. Wow, this is gorgeous. I mean, I know I am going from a black and white LCD screen to a backlit LCD IPS display. Still, I didn't know how much colour would matter to me on the wrist when all I am looking for are notifications and the time. But, I can't deny beauty when I see it. The screen itself is also a touchscreen opposed to the 4 buttons that are found on all Pebble devices. I feel this is just a needed aspect, but I can't say I like it more. I am constantly cleaning off my screen from fingerprints - not something I needed to do often with my Pebbles. 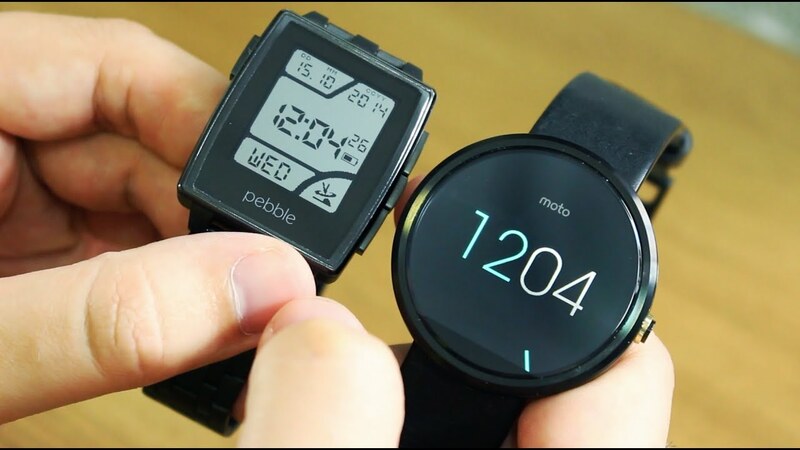 But, Android Wear is designed to use touch to navigate, while Pebble's OS was designed to use buttons. They both do navigation extremely well. 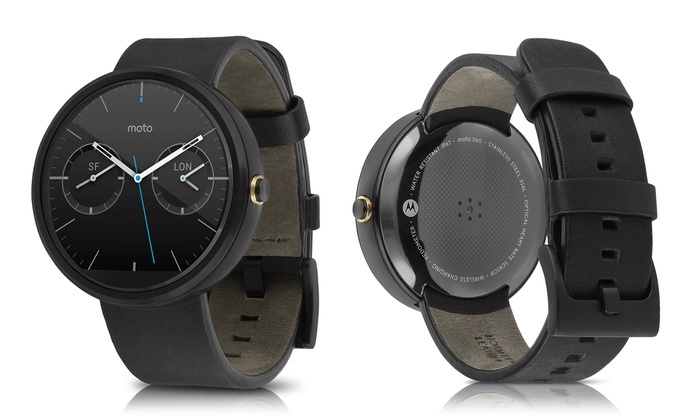 I've learned the Moto 360 is rated as IP67, while the Pebble and Pebble Steel are 50m (5atm). It's not written as apples to apples here, but, I means the 360 is water and dust resistant, so it'll survive the rain, dirt, humidity, and from the test I've seen on YouTube, even showering. The Pebbles, as I said before, can go with you while swimming. Battery life is the hit I have to adjust to. The Moto 360 is on the latest software available, and I've learned back in 2014/early 2015, the battery didn't last long at all. For me, I went to bed yesterday with 55% left. Not bad at all. But to get that, I did shut off Moto Body, and the gesture to turn the screen on. Some sacrifices were made to get the battery to last. A microphone is built into the device, and it is very handy. I have enjoyed simply saying, "Okay Google" and running quick searches and tasks. I also like being able to reply to SMS and Telegram chats with full responses via voice. Very cool and useful! 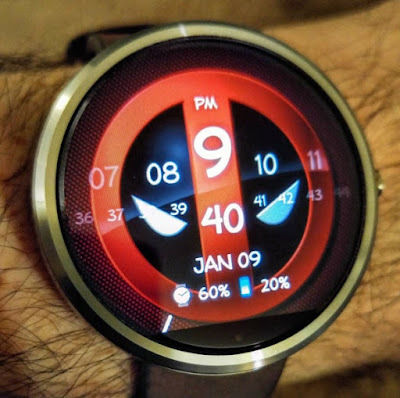 The Moto 360 is a better watchover all for me, but not necessarily for everyone. Compared to the Pebble and Pebble Steel, the Moto 360 looks better on my wrist. I enjoy the colour screen more than I thought I would, and I do enjoy having a microphone available for creating my own replies instead of being limited to Pebble's presets. As one who is getting into fitness this year, the heart monitor is also a useful tool - something that is not found on the Pebble watches I own. The battery life has been lasting me through the last few days with around 50% left. I've shut off a lot of features to get it to this point, but, I'm okay with touching the screen to wake it instead of using the sensor. I'll miss being able to jump in the pool without any concern of water damage. I'm not sure I can trust the Moto 360 to withstand that. I'll also miss seeing the time with great ease w/o taping the screen, or adjusting my wrist a bunch when in direct sunlight. Like I said, the Moto 360 wins this matchup, but only by a small margin. I'll still be hanging onto my Pebble Steel.